I like things that move me emotionally. That describes the music I like. That describes the movies I like. That describes the TV shows I like. That also describes the conversations I like. Things that make me think and connect at the emotional level, something that makes me look towards myself and reflect. 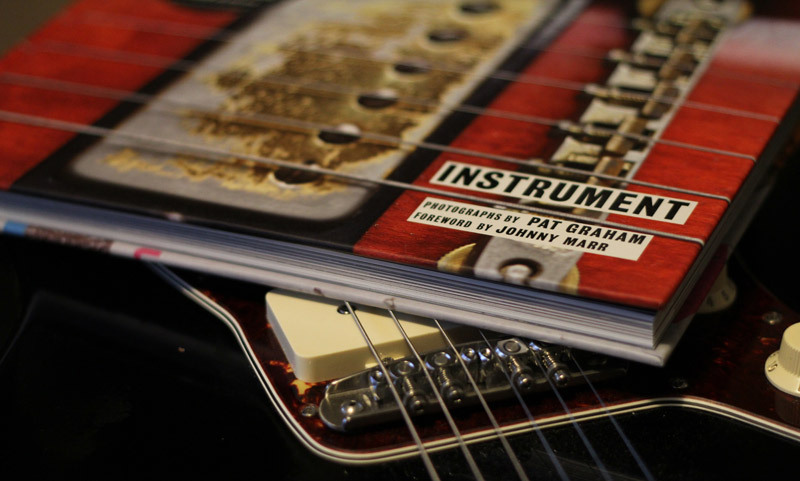 I recently picked up a great book called INSTRUMENT by Pat Graham. I’ve talked about this book in the past and also have given it away as bonus gifts on previous give aways. I knew it was cool and interesting, and finally I picked up a copy for myself. The concept of INSTRUMENT is to show images of various images of musicians and talking about their relationships with those instruments. I thought that would be interesting, and something for conversation… you know, coffee table book. I received the book and I literally couldn’t put it down. The photos in the book were spectacular and it showed the character of the instruments. All the grime, gouges, scratches, blood, sweat and other bodily fluids. It shows the passionate connection between the musician and their instruments. It shows how they’re tied and in a way that it was mesmerizing. I’ve seen a lot of guitar photos in my time, and there shots and angles I have never seen before. Each shot was worth framing and hanging on the wall. I knew there was a foreword by Johnny Marr, a guitarist I respect, but I wasn’t expecting the others featured. Ian Curtis of Joy Division. What! Big fan, and his guitar is in there. Steve Albini, Ian Mackaye, Kurt Cobain, Lee Ranaldo, Thurston Moore, Nels Cline, Doug Martsch, John Doe, just to name a few (there are 50 musicians in total in this book). The book also does not just go into guitarist, but bassists, drummers and keyboard player. The majority is definitely guitarists though. So who the hell is Pat Graham? I wanted to know more. Turns out, this is what he does for a living at a high level. A fantastic professional photographer that often goes on tours with various bands to capture images. His photos have been seen in multiple publications as well as a few photos being featured at the Experience Music Project. I highly recommend this book if you’re looking for something that showcases the reinforcement of the musician with their instrument. I was surprised how I was moved emotionally when flipping through these pages. This is a great gift for any musician friends. You can pick up a copy for $23.53 at Amazon. It’s worth the $23 for sure! My wife brought this book home for me awhile ago out of the blue…so stoked on it…thanks for reviewing hank! Glad you liked it. I was super blown away on how much I dug it.. but then again, it’s a book about guitars.. how could I NOT like it? But really.. Pat did an amazing job.